Convert and attack with Transformers Cyberverse Action Attackers figures! Convert Optimus Prime figure from robot to vehicle mode in 12 steps. The last step of conversion activates Optimus Prime figure’s Bash Attack move! Once converted, attack move can be repeated through easy reactivation steps. 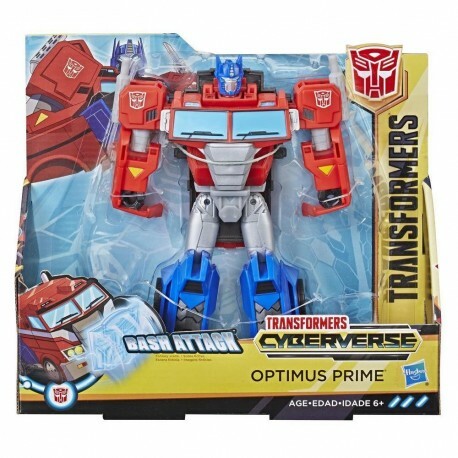 Kids can collect other Action Attackers figures, each sold separately, to discover the signature attack moves of favorite characters from the Cyberverse series -- one of the best ways to introduce young kids and new fans to the exciting world of Transformers! • 7.5-INCH OPTIMUS PRIME FIGURE: 7.5-inch Ultra Class Optimus Prime Action Attackers figure inspired by the Cyberverse animated series. Similar figure scale to Voyager Class Transformers action figures. Makes a great gift. • SIGNATURE OPTIMUS PRIME ATTACK MOVE: Convert the heroic Autobot Optimus Prime to activate Bash Attack move. Fun attack move can be repeated through easy reactivation steps. 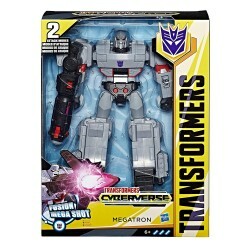 • 2-IN-1 TOY: Transformers conversion for kids ages 6 and up! Convert Optimus Prime toy from robot to truck mode in 12 steps. Please note that since Transformers toys are made for children, some parts are designed to detach if play gets too rough. That way, the pieces can be reattached without damaging the toy. • G1-INSPIRED CLASSIC CYBERVERSE CHARACTER: Classic red and blue Optimus Prime truck toy inspired by the noble Autobot leader from the Transformers Cyberverse cartoon, as seen on Cartoon Network and YouTube. • TV-SHOW-INSPIRED: Transformers robots are giant battling bots from the planet Cybertron. The Autobots and Decepticons traveled from Cybertron on their spaceships, the Ark and the Nemesis, in pursuit of the powerful Allspark. Each Transformers robot has 2 modes. They convert from robots to vehicles such as cars, trucks, jets, and tanks! Each bot has a special ability known as an Action Attack move; these signature attack moves activate in battle! In season one of the Cyberverse television series, Windblade helps Bumblebee connect to the Hivemind to recover his lost memories.